I came across this book by accident, looking for inspiration on the cookbook shelf in our local library, and found it fascinating if completely bonkers. If you’d like to read about extreme frugality in living and cooking, check out “The Garden Cottage Diaries: My Year in the Eighteenth Century”, by Fiona J. Houston, a historian and museum researcher. Apparently when Ms Houston was researching an exhibition about the history of Scottish food, she was ranting on about how people at the end of the eighteenth century would have been better fed than living on today’s processed foods. Someone said: “You try living as they did in the eighteenth century!”, so she did! For a whole year! 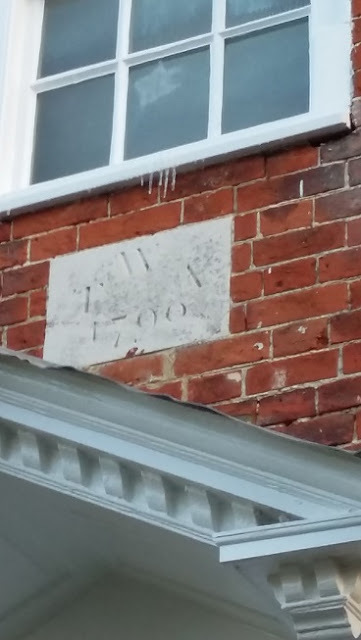 Part of the reason I borrowed the book was because Fiona Houston chose to focus on life in the 1790s, and by coincidence the date stone on our house is from 1790. I was curious to find out more about how people lived during the period when the main part of our home was built. I read with mounting interest and horror all the implications of an eighteenth century environment – not just the constraints of clothing, laundry problems, restricted diet and waking up in fridge-level temperatures, but the sheer amount of time spent chopping and carrying wood, starting fires without matches and even making her own candles, broom, string and ink. A particular low point came when the author delayed turning over the wool-stuffed mattress in her box bed, and found that it had gone mouldy underneath. Much as I may moan about the restrictions of our pre-War Aga, it’s nothing to the cooking issues faced by Ms Houston. It turns out when you can’t spend money on fripperies like internet access, clothes from shops and electricity, life becomes a lot less expensive. Ms Houston supplemented the small amounts of food she bought with fruit and veg grown in her garden, foraging and presents brought by a parade of visitors, and ended up spending just under £1,275 for the year. (The bus trips are anachronistic, but she compared them to taking a stage coach). Now I’m all for a slower more simple life, and could certainly do with saving some money. I regret the amount of time I spend on screens, prefer cooking from scratch to processed foods, and enjoy walking where possible as opposed to relying on the car. Some of the menus and recipes may yet provide inspiration – perhaps the persistent nettles in our veg garden can be put to better use as soup, and the bannocks and dried apple slices look genuinely tasty. I remain keen to attempt growing some fruit and veg now we actually have a garden. Seasonal menus, based on local food. But have no fear, I have no intention of attempting to recreate past centuries, although I take my hat off to Ms Houston for slogging through an entire calendar year. I have enormous admiration for her resourcefulness, resilience and self-denial. Her book is both interesting and inspiring, describing a gloriously eccentric experiment. I love this book, have a copy and have read it several times. I disagree that she was bonkers as I thought it a worthwhile social experiment – though I can't say I'd do it myself! I've also got her other book – Seaweed and eat it! Fair enough! I've just been back to remove one of my "bonkers" references, as I do love this book very much, and find Ms Houston's experiment fascinating. But oh my gracious if I ever had rose-tinted views about past times, this has well and truly revealed the grinding reality of daily life. Thanks for letting me know about her other book, I'll see if I can track down a copy. A friend gave me this book last Christmas thinking that I would be interested. Well I was fascinated. Like you, it impressed on me how much hard work was involved in life then. I've read this book too and loved it. And do eat your nettles this year 🙂 There are hundreds of recipes on Pinterest (of course) but I usually just use them where I'd use spinach. make a cheese sauce and mix in cooked spinach (or nettles) and put in a baking dish. Top with baked beans then cover with mashed potato. Sprinkle with grated cheese and bake until hot and crispy on top. I'll have to dig it out and have a read, if nothing else it will give me some more ideas of what to do with the nettles when they start to make a reappearance.